Lock in a great price for Lympne Castle Cottages – rated 8.8 by recent guests! Bed very comfortable, beautiful setting, great parking outside the cottage. Breakfast at the Bistro was great and thoroughly enjoyed by everyone. Stayed in Gatehouse cottage the day before and after getting married in Lympne Castle. A delightful, well kept cottage that oozes character and has a wonderful courtyard garden out the back. Clean, modern bathroom and shower. Good selection of toiletries. Plenty of cookware / crockery / glassware available in the kitchen. Beautiful and very quiet surroundings. Will definitely return. We rented cottage for a couple of days for my daughters wedding. We had an amazing time and the cottage was perfect for us all. The bistro nearby was excellent great time had by all. Pros - Assuming most people who rent these are attending a function at the castle (like us), absolutely perfect. In a converted part of the old building and only about 200 metres from the venue entrance. Inside modernised enough to provide all you need for a couple of night's stay, decent kitchen, modern central heating etc. The space of the cottages. Amazing and had all the facilities needed. Nice spacious cottages with plenty of room to move around in. Lovely views and comfortable beds. Basic amenities of every cottage was ample. Very clean on arrival. One cottage upstairs which could have been clearer on booking but not a problem for our party. We stayed due to attending a wedding taking place in the castle. Couldn’t have asked for a better place to lay our heads. Right next to where everything was so amazingly convenient and so easy at the end of a long day to wander back to. Especially as half of our group were ready to leave before others. So clean and tidy and wonderfully comfortable! It was a wet and windy night but all we felt was cozy in our little cottage! Would highly recommend! The bistro on site for breakfast is also top quality and extremely convenient! Fabulous! Location is amazing. Highly recommend it! 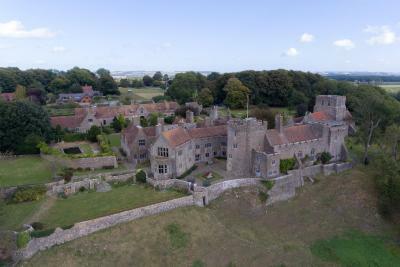 Set in the beautiful Kent countryside, Lympne Castle offers charming cottages and rooms, close to Folkestone. There is good access to the M20 motorway. In the grounds of stunning Lympne Castle, these cottages offer modern accommodations, for up to 6 people. Lympne Castle Cottages have stylish living areas with a TV and DVD player, while the fully equipped kitchens have a dishwasher and laundry facilities. 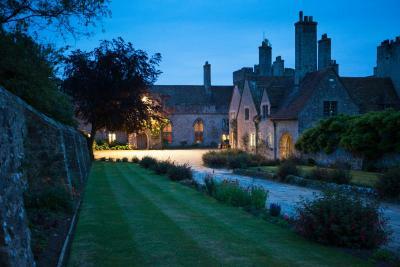 Canterbury is 30 minutes' drive from the cottages, and The Channel Tunnel is 5 mi away. The local pub is a short walk away and serves food all day. When would you like to stay at Lympne Castle Cottages? This holiday home comes with 2 single beds and 1 king-size bed. Kindly note the accommodations is is accessible via stairs only. The fridge does not have a freezer compartment. House Rules Lympne Castle Cottages takes special requests – add in the next step! Lympne Castle Cottages accepts these cards and reserves the right to temporarily hold an amount prior to arrival. This hotel does not accept American Express cards. Please inform Lympne Castle Cottages of your expected arrival time in advance. You can use the Special Requests box when booking, or contact the property directly using the contact details in your confirmation. 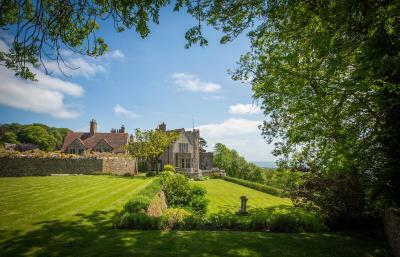 Please note that check-in and key collection take place at: Lympne Castle Between 2pm - 4pm, Lympne CT21 4LQ. Heating a little too hot but turned some of the radiators down so ok. No black bin bags for rubbish. Poor phone signal but that's just how it was for the area. No Wifi (that I was aware of), which would have been really useful considering the lack of phone signal. A little tired. Sofas and pillows need replacing. Cons - No internet.... Seriously, in this day and age ??? Not even a mobile phone signal (because of the thick stone walls) unless you go upstairs and hold your phone to a window. Lack of internet is clearly stated in the listing but a simple WiFi repeater should be added to just complete the "modernisation". Only other niggle, poor security. A large sign saying car thieves operate in the area but only one, very dim, overnight light for the whole road the cottages are on which isn't even enough to see the key lock on the cottage nearest to it (torch required to get in late at night). But, overall, the Pros outweigh the Cons. The heating. It was too hot! We rented all the cottages for our wedding. They were absolutely perfect for what we needed them for. Well equipped and comfortable. All a good size and the three beds were particularly huge! when we arrived it was very busy ,we were not informed that there was filming at the castle and it was out of bounds , whilst drinking our coffee outside in the morning we were told to move in no uncertain terms by a angry woman with a clip board who informed us that we were trespassing as they had paid for the rights to the castle .